DVDs of past shows as well as the 50th Anniversary Commemorative Video are available. to make an immediate donation. Become a member of The Sudbury Savoyards, Inc.! Membership Details . . .
Support the Savoyards when you shop at Amazon! The Sudbury Savoyards will benefit from your purchases at Amazon if you start at AmazonSmile! Just start with the link below and connect The Sudbury Savoyards to your account and Amazon will donate .5% of your eligible purchases to the Savoyards. There are several ways to get information about Sudbury Savoyards events. Sign up to receive our e-newsletter, The Sandwich Board. 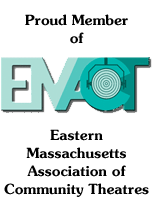 Local agencies which are supported by the Mass Cultural Council, a state agency.